In late February, NPR announced the #trypod initiative for the month of March. 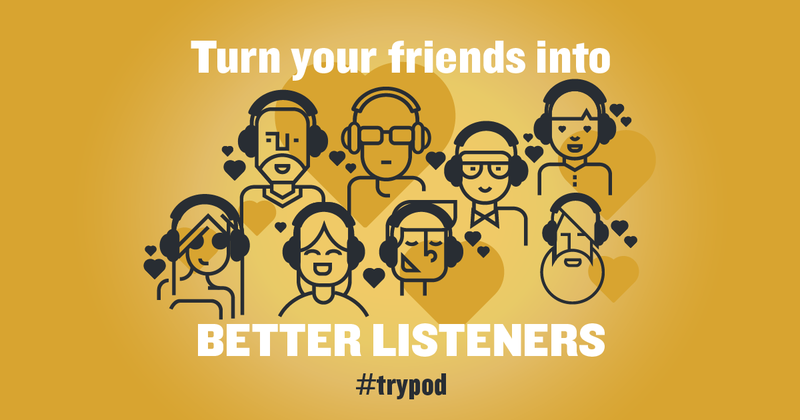 Dozens of podcast creators encouraged their listeners to encourage others to try a pod(cast), in an effort to increase monthly listeners and share awesome content with more people. Though March is almost over now, I’d still like to recommend a few of my favorite podcasts. Even if nothing on this list interests you, there is a podcast on every conceivable subject, and I’m sure there’s one out there that’s perfect for you. If there’s a podcast you want people to try, please leave a comment! All of these podcasts are available on iTunes as well as online. I’ve written about this podcast for The Claw before, but Welcome to Night Vale is a classic. It’s a surreal, supernatural, vaguely horrific news broadcast from a friendly desert community that’s equal parts beautiful, creepy, and hilarious. A typical day of radio from Night Vale consists of a breaking news story, a couple of updates about local characters, and the weather. There are plenty of cool, diverse characters, with cool, diverse voice actors, and the music and sound design are great. A year-long story arc tends to tie the episodes together, though many are completely one-off, and some contain information that becomes relevant about four years later. Remember that intern from episode 3? You should. Sometimes there are swears in the weather, so I don’t advise listening near little children. Also, little children don’t love stories about journalists hacking legs off with hatchets. Trust me. Welcome to Night Vale is weird, cool, emotional, funny, and absolutely teeming with spiders. Listen to three brothers and their dad play Dungeons and Dragons really, really badly! If you’re going to get upset at incorrectly used spells, elevators in a high fantasy world, or an old man who has played for two years and still can’t tell which die is the d20, don’t listen to The Adventure Zone. Jokes aside: this is probably my favorite podcast right now. A campaign that started as the Lost Mines of Phandelver adventure from the 5e starter set soon became a sci-fi/fantasy adventure full of secret moon bases, battlewagons, time loops, crystal golems and murder game show elf liches. It’s a frankly bizarre story that only works because the people writing and playing it are creative, funny, and unafraid to make their characters do stupid things. The wizard just won a boss battle by turning into a T-Rex. Also, the wizard’s name is Taako (pronounced “taco”). Despite the general mood of wacky fun, the characters are all well-developed and unique, and sometimes the dialogue and descriptions feel more like a radio play than a family D&D session. Sometimes it’s genuinely touching. It also has an incredibly well constructed plot with so many twists and turns that it shouldn’t work yet it TOTALLY DOES. And then we spend 10 minutes arguing about dogs on the moon. There are none. The McElroy brothers have a whole host of other podcasts as well, and they’re all so good. Check them out here. The Penumbra feels like an experiment. Not in the way that it’s unfinished or less professional than others on the list, but in the way that it’s an amalgamation of tropes and genres that baffles and confuses, yet still makes perfect sense. A female Robin Hood and her Marian (or Mary Ann) in the wild west? A film noir-esque private eye and a femme fatale (well, he’s not really a femme, but our private eye doesn’t mind at all) on Mars? Somehow, it all works. The Juno Steel stories tie the first season of the podcast together, with unrelated 1-shot episodes in between each case. Some of those are horror, some are queer ladies in a gunfight at an orphanage. Take your pick. All feature great voice actors and creative plots. The subject matter tends to be darker in The Penumbra than other podcasts on the list, but there are content warnings in the episode descriptions if you should need them. Season 2 of Juno Steel’s adventures just started with the release of The Kitty Cat Caper part 1, and the first two episodes of season 1 were rewritten and rerecorded, making this the perfect time to start listening! Maya Angelou said “Do the best you can until you know better. Then when you know better, do better”. Travis McElroy quoted this in an early episode of Interrobang, and it stuck with me as an excellent statement of the philosophy of the show. Covering everything from how to deal with insulting Facebook memes to North Carolina’s incredibly awful bathroom laws, Tybee Diskin and Travis McElroy talk about whatever topics are currently frustrating them. Travis and Tybee are both considerate, caring (and funny!) people who bring their experiences in the world to their conversations while recognizing that their experiences are not the default or the same as others’. They know that they will mess up, especially while talking about subjects they have limited personal experience with, and instead of being defensive or avoiding hard conversations they invite their audience to tell them when they are wrong so that they can know better and do better. In a world where there’s a lot to be upset about, Interrobang is an incredibly positive and uplifting thing to listen to. “Therapy for the strange and unusual”, reads an advertisement for Dr. Bright. She specializes in teaching “atypicals” how to cope with and control their superpowers, as well as their everyday struggles. Follow her lovable cast of patients as they learn how to avoid anxiety-induced time travel, deal with hearing the thoughts of others, and deal with romance while feeling the emotions of everyone around them. And underneath, a plot full of kidnapping and secret government experimentation. It’s is full of talented voice actors, and has the social media tie-in content I’ve ever seen. The Bright Sessions talks about mental illness both through superpower symbolism and realistically, and does so in a way that a character’s illness is never something that needs to go away in order for them to be complete. It’s a trait rather than a fatal flaw. Mental illness is so often ignored or even demonized, so it’s really refreshing to hear people talk so openly about it and in such an interesting way.